More and more people are turning to DIY Website Designs for their businesses. One reason is cost. Many small, or startup, businesses don’t have the budget for a full custom designed website. Another reason is that they have a product, or service, that needs to be updated on a regular basis. We’ve tailored our new service to fill the needs of these people. There are no up front charges for this work and no obligation to purchase our services. We also offer email, and phone, support packages to help teach you how to maintain your website site. The image above is an example of how, working with the client, we were able to create a custom banner using his photograph and our graphical design capabilities. 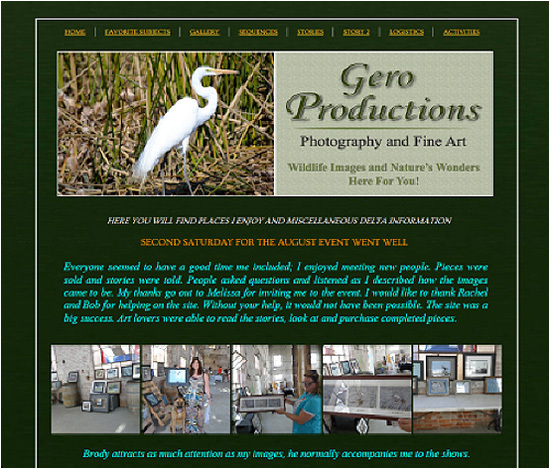 This client also ordered a new fully customized WordPress site from our company..
We been working with the owner of Gero Productions for a while now helping him design a DIY Website for his company. He has to change his content on a regular basis so it is important that he have the ability to make changes on his own. We did the basic graphic and design work for him and he took off on his own. 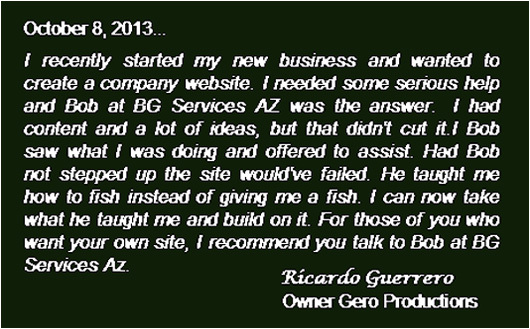 BG Services AZ is a locally owned, and operated, family business. Our goal is to provide the highest quality products, and services, at affordable prices. We take the time to learn as much as possible about our clients and their business. We take pride in our ability to develop products that accurately reflect the image of your company. We never use Templates. All work is Custom. Our Customer Service, and Support, are second to none. We look forward to the opportunity to work with you on this, and other, projects.